I know most of you would surprise to see this post at this time of the year as this cake is generally made during the Christmas time when the dry fruits have been marinated for days, weeks or even months to make the Plum Cake. My husband is a huge fan of plum cakes and he's been complaining ever since that I do a lot of baking and have never made things he likes the most like plum cakes, chocolate walnut fudge and fondant cakes. Although I did make a fondant cake which I have not yet updated on this blog. Here I am with freshly baked plum cake. Since we are just the two of us at home, I made a boozy version of this cake but booze is totally optional. The cake is very good on its own and does not need any frosting but still if you would like to frost this cake, reduce the amount of sugar from the recipe. 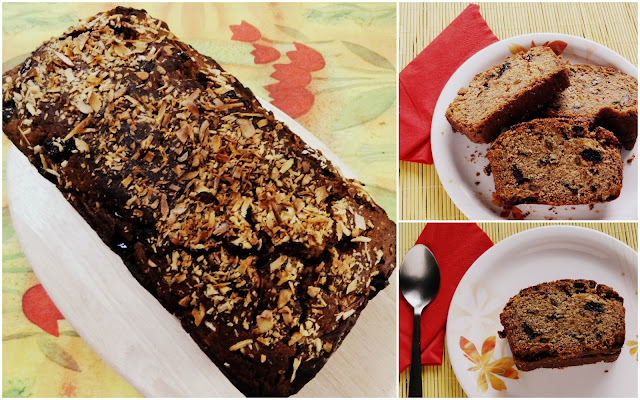 The softened dry fruits makes this Eggless Plum cake very dense and moist. The good part, you don't necessarily have to marinate the fruits for days for this version of the cake. Do I need to say that hubby just loved this cake?? :D He finished the entire loaf in just 2 days. Pre-heat oven to 350F / 180C. Grease and line a 9"x5" load pan or 8" round cake pan, whatever you prefer. Bring the water to boil in a pan and add the dry fruits (leave out the tutti fruity if using them), brandy and the sugar. Simmer for about 7-10 mins until the dates have softened but not mushy. Turn off the flame, remove the pan and set aside for 5 mins to cool slightly. Add the butter, vanilla (or zest) and baking soda. The mixture will foam a bit. Set aside to cool. In another bowl, sift together the flour, baking powder, and salt. Add the spice powders and mix well to combine. Add the cashew nuts and tutti fruity (if using) to the dry mixture. You can also add some chopped preserved cherries at this stage. Add the cooled fruit mixture to the flour mixture and add the vegetable oil. Pour the batter into the prepared pan and bake in the pre-heated oven for about 50 mins. If the top seems to be cooking too quickly, loosely cover the pan with aluminium foil.